Catherine Campbell?s experience as a nurse and as the mother of two handicapped girls, whom she cared for until they died at ages 10 and 13, has given her a unique insight into suffering. As an inspirational speaker she frequently encounters people with tragic stories. And yet she believes that God is Lord and that in both good times and bad, He is always good. Isaiah 40.31 says, that 'those who wait on the Lord shall renew their strength: they shall mount up with wings like eagles.' She comments, 'How often have you wakened in the morning knowing that the problem, or the pain, or the unpaid bill has not disappeared? We worry and fret ourselves into exhaustion. Yet God has promised us endurance. 'The great eagle cannot reach the heights merely by its own strength. As it spreads its impressive wings the bird allows the wind to carry it to places no other bird can go. This kind of flying appears effortless because the eagle trusts in a power bigger than itself? the wind!' 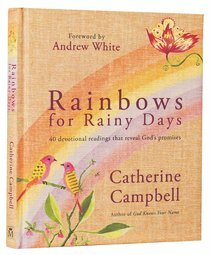 In this unique devotional, Catherine examines different aspects of God?s love for those times when life gets hard. About "Rainbows For Rainy Days"